, Wednesday, March 8, 2017 — Wellington, FL (February 28, 2017) – Internationally competitive dressage riders Adrienne Lyle and Charlotte Jorst know that accuracy and attention to detail are keys to a winning ride. 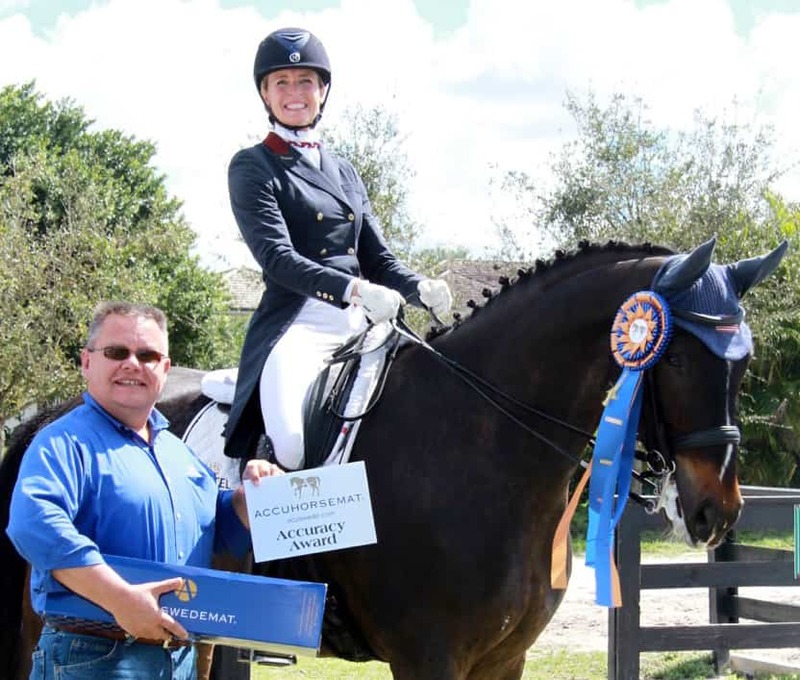 Acuswede, the North American distributor of the innovative equine acupressure blanket Accuhorsemat, recently honored both riders for their precise and beautiful tests at the Adequan Global Dressage Festival in Wellington, Florida. Adrienne Lyle and Betsy Juliano’s Horizon, a 10-year-old Oldenburg mare (Hotline x Revue, Don Schufro), were noticed by Acuswede during the CDI5* at the Adequan Global Dressage Festival. Lyle and Horizon bested a large field of competitors by winning the Intermediate I with a 73.553 percent and the Intermediate I Freestyle with a 75.325 percent. Colleen Elliott, a co-founder of Acuswede, was excited to present Lyle with the company’s Accuhorsemat Accuracy Award. “You have to have really correct training in order to do the things accurately, so an accurate ride reflects on your whole training system,” Lyle said as she accepted the award, adding that the mare she has ridden for two years has stepped up and come a long way quickly. “Our goal was to get her in the CDI ring, and now that she’s doing well there, it’s a balance of doing as much as we can in the Small Tour CDI and also focusing on bringing her up to the Grand Prix. I’m excited about her because I think she’s going to be an even stronger Grand Prix horse. She’s got that engine you need and she’s got a super piaffe and passage, so I think she’s actually going to excel even more. She seems to keep rising to the occasion, and she certainly has the work ethic and the drive,” said Lyle, who represented the USA in the 2012 London Olympic Games and hails from Ketchum, Idaho. The next Accuhorsemat Accuracy Award presented at the Adequan Global Dressage Festival went to Charlotte Jorst and her own Ray Dance, a 2009 Westphalian gelding (by Rockwell). The pair also placed first in both the Intermediate I with a 70.263 percent, and the Intermediate I Freestyle with a 73.000 percent. Jorst, who manages her own equine apparel company Kastel Denmark out of Reno, Nevada when not in the show ring, has owned Ray Dance for almost two years. “He’s wonderful to ride,” she said. Jorst has been coming to Wellington for the Adequan Global Dressage Festival series for three years, and appreciates the chance to compete in so many shows there. She will next head to competitions in San Diego, California. Thomas Willetto, Acuswede’s other co-founder, was happy to present Jorst with the Accuhorsemat Accuracy Award. Acuswede was impressed by both Lyle and Jorst’s dedication to accurate riding. As an official sponsor of the 2017 Adequan Global Dressage Festival, the company recognizes riders and horses who complete accurate tests throughout the winter dressage show season. Elliott and Willetto present the winners with an Accuhorsemat Accuracy Award ribbon, an Acuswedemat acupressure therapy mat for people, and an Accuhorsemat sports pack. In addition, the riders earn a complimentary Accuhorsemat therapy session for their horses. While sponsoring the show series, Acuswede also served as prize presenter for a CDI Jog. As prize presenter, Acuswede donated an Acuswedemat to the winner of the ShowChic CDI Jog Best Turnout Award. Janne Rumbough was selected as the rider dressed best to impress, and explained that she makes sure that both she and her horse are carefully turned out to show respect for the judges, the show, and the sport. As a fan of acupuncture, she was thrilled to receive the Acuswedemat for people. Originally developed in Sweden, Accuhorsemats and Acuswedemats are quickly gaining popularity throughout North America. Accuhorsemat, an equine acupressure blanket that reduces tension and soreness in horses, can be used before riding to improve warm-up, after riding to enhance muscle recovery, and in between massage, chiropractic, or acupuncture treatments to maintain mobility. Accuhorsemats and Acuswedemats can improve mobility, performance, and overall health while significantly increasing blood flow and assisting in removing tension in connective tissue. Both products are available for purchase from The Tackeria, located across the street to the Adequan Global Dressage Festival showgrounds. To learn more about Acuswede and the equine and human acupressure products that the company provides, please visit www.acuswede.com.